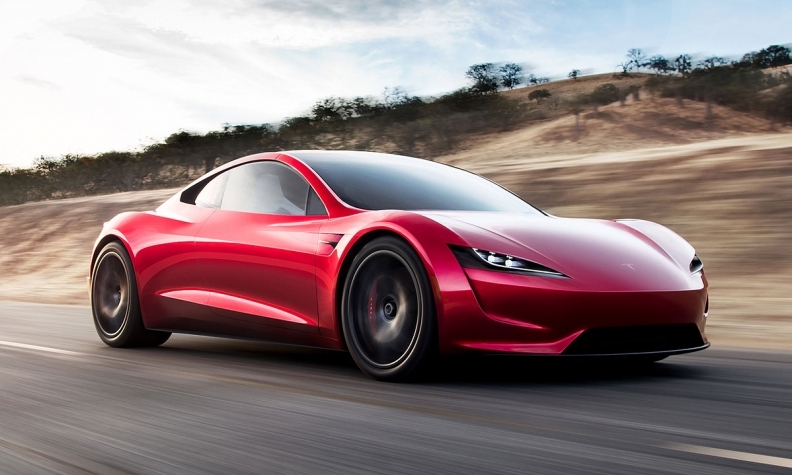 Roadster output will start in 2020, Tesla said. HAWTHORNE, California, USA -- Leave it to Elon Musk to know how to play to an audience. 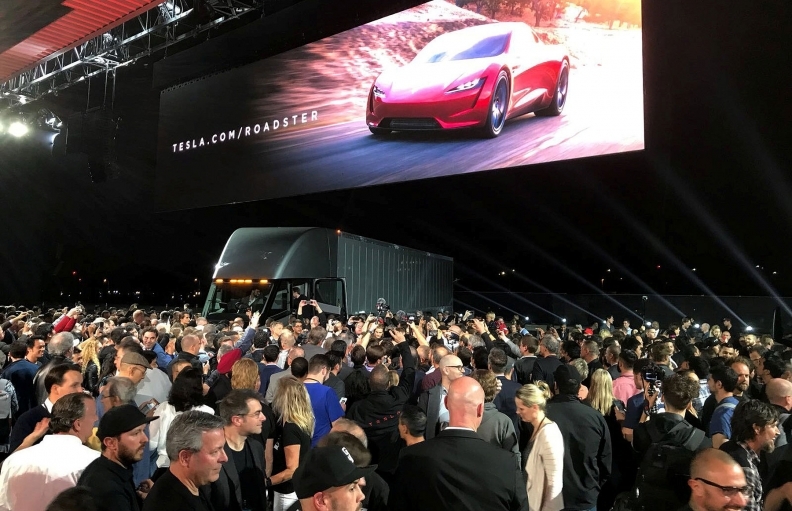 At the end of the global unveiling of Tesla's forthcoming long-haul semi truck Thursday night at the company's facility here outside Los Angeles, the CEO pulled a $250,000 trick out of his sleeve: the second-generation Tesla Roadster. 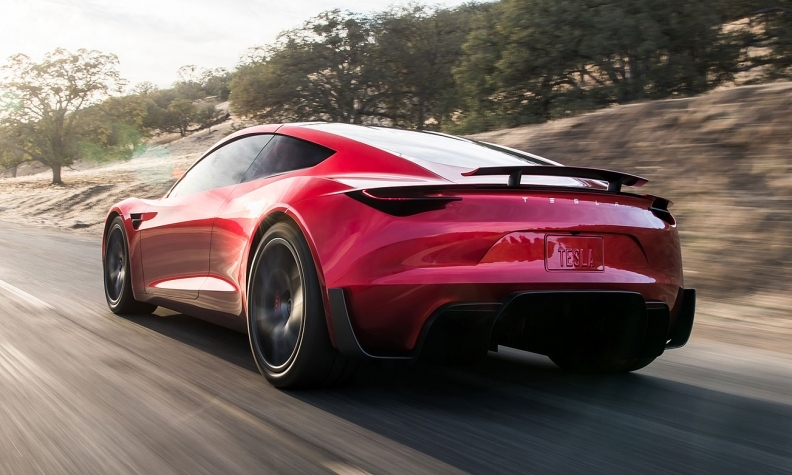 A surprise to the entire audience and many Tesla employees, the all-wheel-drive supercar harkens back to the company's roots; it was the original Roadster that Tesla used to crack into the automotive world in 2008. Just under a decade later, its successor comes just when Tesla needs the morale boost -- and the cash -- that will come with such an attention-grabbing model. Fully-refundable deposits of $50,000 are being taken immediately, Tesla said. The full price of the base model: $200,000. The first 1,000 Roadsters will be in the Founder's Series and will cost $250,000, all of which is due in deposit form immediately upon order. The specs of the Roadster are remarkable, even for an electric vehicle. It will be all-wheel drive via three electric motors, seat two adults and two kids and feature a removable roof. The base iteration will be able to accelerate from 0-60 mph (96.6 kph) in 1.9 seconds, Musk told a rapturous crowd. Maximum speed on top-end models will exceed 250 mph. It will do the quarter mile in 8.9 seconds and has a 620-mile (997.8-km) range from a 200 kWh battery pack. Production will start in 2020, Tesla said. While the Roadster is sure to draw attention -- and likely deposits -- the world over, the logistics of producing it remain tricky. The second-generation Tesla Roadster made a surprise appearance Thursday. Tesla is facing a significant cash shortage right now due to production bottlenecks and delays with the new Model 3. Where and when Tesla will add a second line of production for the Model 3 remains a crucial unknown at this point. Adding Roadster output -- even in 2020 and even if volume is significantly lower than the Model 3 -- would be inordinately expensive. "Elon's showmanship remains intact, even as his customers' patience for Model 3 delivery wanes," said Karl Brauer, executive publisher of Kelley Blue Book. "The specs on the new semi truck and sports car would put both vehicles at the top of their segments ... assuming they can be produced and sold as part of a sustainable business plan. So far that final element has eluded Tesla Motors, which makes it difficult to see these vehicles as more than 'what if' concept cars."